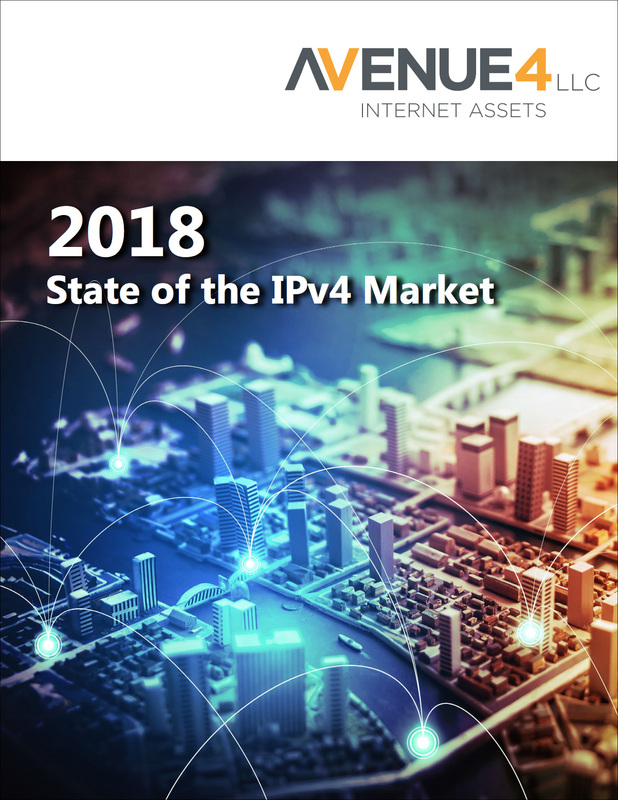 2018 State of the IPv4 Market Report by Avenue4 LLC (Click to Download Full Report)Escalating prices for large IPv4 number blocks, coupled with aggressive buyer acquisition strategies throughout 2018, stimulated considerable additional supply, according to the 2018 State of the IPv4 Market Report released by Avenue4 LLC. After soft global activity in 2017, the inter-RIR market recovered with the largest inter-RIR transaction in the history of the market. With demand still far exceeding supply, IPv4 numbers once trading for as little as $4 per number sold in 2018 for $20 per number (occasionally higher) notwithstanding the influx of large block inventory into the market. Unit prices across all block sizes also rose steadily in 2018. The small block market (transactions of fewer than 4,000 IPv4 addresses) continues to represent a dominant and growing portion of the total IPv4 market. There was a steady influx of large block supply (transactions greater than 1,000,000 IPv4 addresses), particularly from /8 holders, but this surge points to an extended period of limited large block supply in early 2019. Overall Inter-RIR traded volumes involving ARIN buyers and sellers have been trending downward for transactions comprising fewer than 1 million addresses. Market indicators show no sign that IPv6 adoption has had any adverse effect on IPv4 market activity. "2018 was a strong bull market for IPv4 trading. While prices increased to their highest levels to date across all market segments, the total volume of numbers sold and transactions closed also exceeded trading volumes in all prior years.," said Marc Lindsey, president and cofounder of Avenue4. "We expect these exceptionally high volumes point to reduced supply in the first half of 2019. But demand and prices will remain strong, which will drive prices further upward and tease out new supply deep into 2019." Local Time: Tuesday, April 23, 2019 07:23 AM PDT – Page Load: 1.1786 Sec.